Make a statement with a Personalized set of Playing Cards at your event. Design them yourself using your own artwork or the help of our design team of specialists. 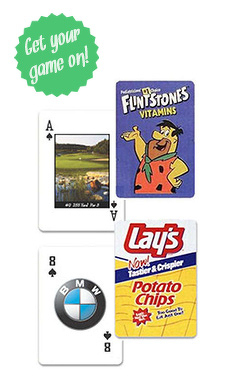 Deal up custom playing cards to your audience and show everyone just how important they are. Create a masterpiece of playing cards with designing your very own deck. Be the CEO of your event handing out these executive playing cards. Create a stunning display that will leave the board meeting breathless with custom designed playing cards. Draw a winning hand with these plastic playing cards designed by you for your event. If you have artwork great! Otherwise lean on our shoulders and let our design team create your unique set of playing cards. Customize your event with the help of custom playing playing cards. Have you ever heard of the saying "less is more." Keep it simple while keeping the cost down with these set of cards with only a one color imprint. Add to your big day and leave guests in awe thinking about your wedding with personalized playing cards. You are already have enough to worry about let our design team capture the best artwork for you life changing event.